I worry about everything. And now, I'm starting to worry. Things are spinning freakishly out of control. Who would have guessed? My life is all messed up. Freakish does not adequate describe my life. I think one of the ladies at work is a demented psycho - she smiles this weird fake smile that makes me squirm. I can barely look at her when she breaks into this weird look. But looks I can forgive...I'm not a beauty either. But this girl has pushed me over the crazy ledge. What did she do that makes me despise her so much? It's hard (and boring) to go into with relative strangers. I've decided that the best way to handle her is with the most basic and general answers I can muster. You see, part of this girl's most annoying characteristics is to ask me the most mundane and ridiculous questions. So I'm responding in kind. Example of our conversation. I'm called Me. She-who-must-be-ignored is Her. 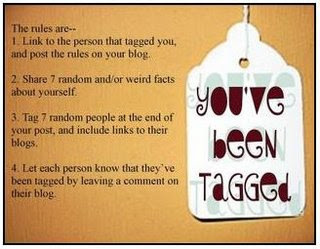 I have to give credit to Holly, who tagged me and inspired me to start posting again. 2. I love the television show Mad Men. It's on AMC on Sunday nights. I watch it at 10 p.m. and then I watch the repeat immediately after at 11 p.m. (in case I miss anything). Wow, it's been a while since I've written. I did not mean to take such a long hiatus; and I've been thinking about the blog for weeks. I was not intentionally avoiding my duties; I liken my absence to the voicemail message from that friend who called weeks ago. I've been meaning to call her back but something else inevitably comes up.